Chewing is an essential activity for dogs – it helps keep them happy and healthy by cleaning teeth, strengthening their jaws, and preventing boredom and destructive behavior. As a pet parent, you should ensure that you satisfy your dog’s natural chewing instinct in a healthy and satisfying way. We set out to create a chew alternative that wasn’t just healthy, but tasted great — two simple principles that guided our development team. DreamBone chews have all the benefits of a rawhide chew… without the rawhide! 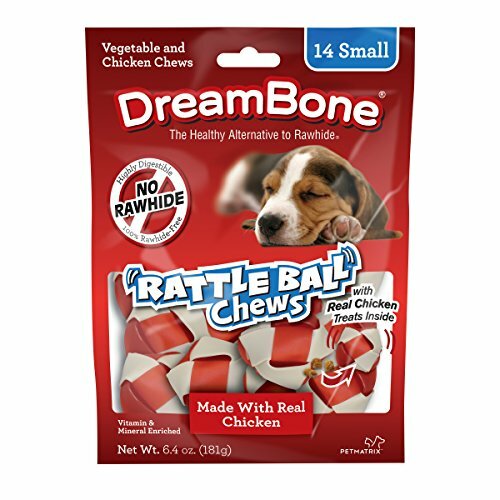 No rawhide DreamBone RattleBall chews are made with real chicken and wholesome vegetables, and have chicken surprise treats inside for lots of shake, rattle and roll fun play, and a scrumptious taste dogs can’t resist! Vitamin and mineral enriched, these chews help maintain your pet’s healthy teeth and gums, and are 100% delicious! These innovative chews, which contain no rawhide, are also easy to digest. Try DreamBone RattleBall Chews and see why 9 out of 10 dogs prefer DreamBone chews over the leading rawhide chews. If you have any questions about this product by DreamBone, contact us by completing and submitting the form below. If you are looking for a specif part number, please include it with your message.